Greeks mythology is replete with the worship of heavenly bodies, especially the stars. What the Greeks learned worshipping these stars was their relationship to each other and the world. The groups of stars they choose formed animal shapes, were given names, and denoted the seasons and months, starting with Ares. 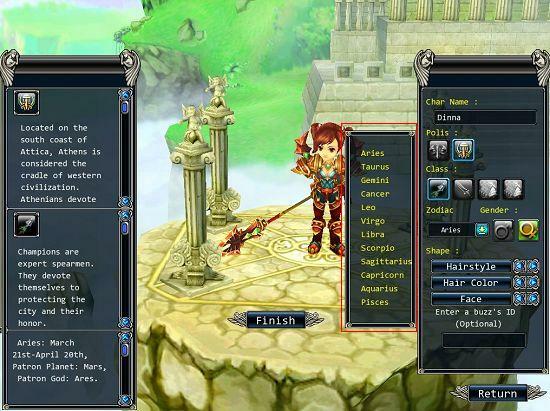 During the initial setup, each character will have the chance to select a zodiac sign of their choice. Each zodiac sign grants characters advantages in different areas. However this does not mean the zodiac signs are all different. They all have two things in common, they start with the same amount of points and they're goal is to strengthen and protect characters. 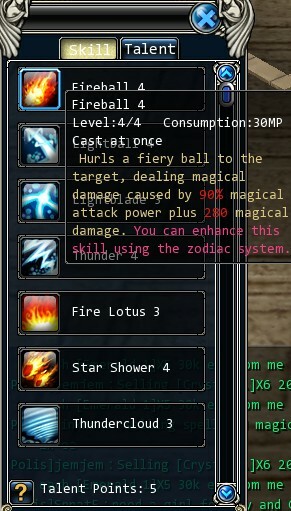 When a character reaches a certain level and has a certain amount of zodiac energy collected, he can click the "+" icon to upgrade his zodiac level. The lower part of the interface that reads "Stored Energy" will show the accumulated energy / and the energy required to level up. As the accumulated EXP and Talent EXP reach their storage limits, they need to be withdrawn and used before more can be collected. Once the zodiac system has been activated, players will each get one free lucky day per week. To activate their Lucky Day, players must visit the Fortune Teller in the major cities ( 75,-120 Athens and -13,0 Sparta). During the Lucky Day (24 hours from the time it is activated) players will gain an extra 5% on the effectiveness of their accumulated Exp and talent EXP. If one Lucky Day a week isn't enough, players can use gold to activate more. If players are not able to login for more than a day, or they login for less than an hour on one day, they will be compensated with a complimentary hour of Zodiac energy. If a player would like to change their zodiac sign they must visit the Fortune Teller in one of the major cities ( 75,-120 Athens and -13,0 Sparta). Every player has one free chance each month to change their sign. For the more indecisive players out there, additional changes can be made using gold. Players can insert attacking skills of their choice into the Attack Skill Improvement box. The improved skills will receive a boost in power by a certain percentage, but the MP consumption will increase proportionally. Players can insert the attacking skills of their choice into the Attack Skill Training box. Trained skills will see their damage increased by a certain amount, but their MP consumption will increase proportionally. Players can select skills of their choice from the Select Skill column and insert them into the Defense Skill Training box. Trained skills will see their damage received reduced by a certain amount. The higher the level of the skill the more effective it will be in reducing damage. 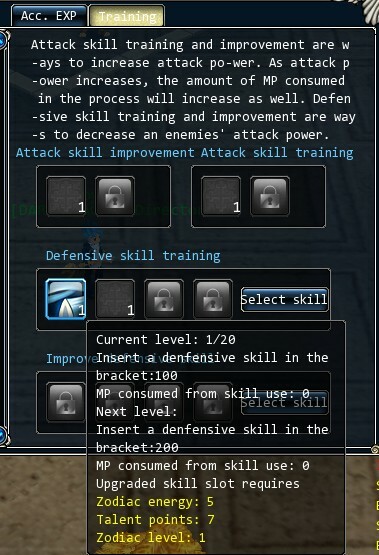 Players can select skills of their choice from the Select Skill column and insert them in the Defense Skill Improvement box. The improved skills will reduce the damage received by a certain percentage. The higher the level of the skill the more effective it will be. 1. Only skills inserted in the boxes will have trained effects. 2. Every skill box has a specified advancement requirement, and the effectiveness and MP to be consumed after the training advancement are set as well. 3. 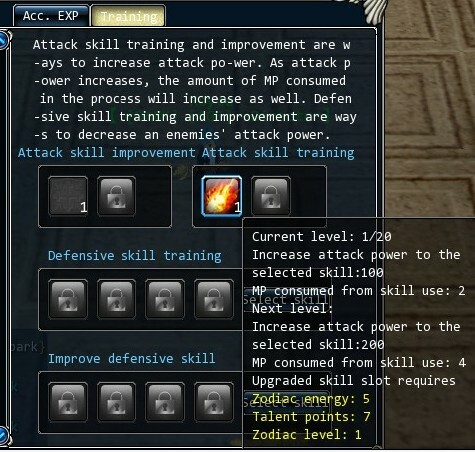 Skill training advancement can be restricted to the zodiac level of the character, at a certain ratio: one zodiac level to two skill levels. For example, at zodiac level 2, the maximum skill level allowed is 4, and at zodiac level 3, the maximum skill level allowed is 6. After giving players an overview of the training function, it would be best if they take a look at the training process. 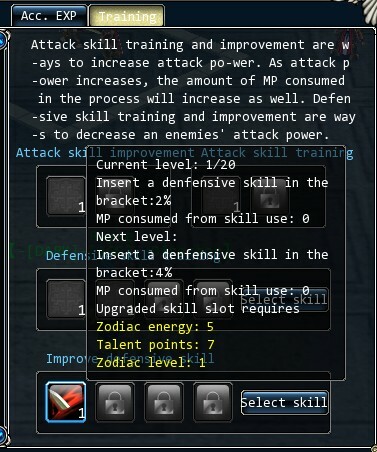 Players can unfold the Zodiac interface and go to the Skill Training column. There will see four set of boxes as shown below. Each set of boxes corresponds to a unique function. A number of boxes can be activated by simply left clicking with the mouse while additional boxes can be activated with gold. 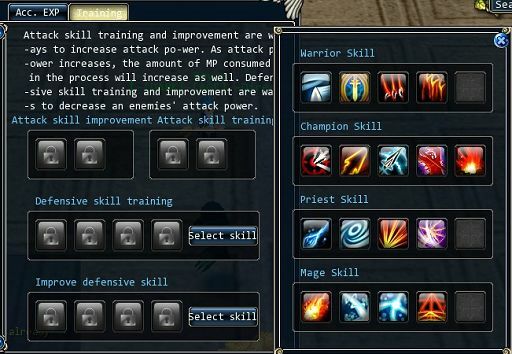 To learn what skills can be trained and under what category, players must visit their skill interface (shortcut key "s") to check what skills are suited for training. 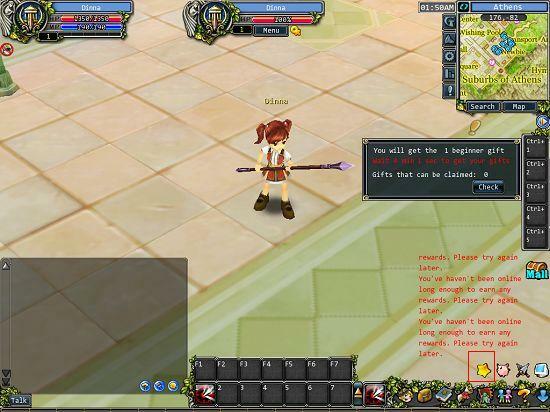 For defensive skill training, players can choose from the skill column on the right, which organizes the defensive skills into their associated classes. 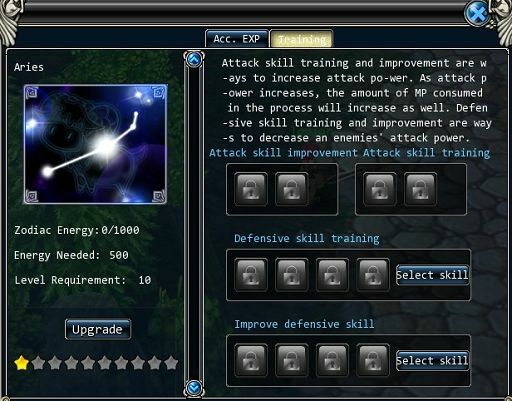 After placing a skill in its corresponding box, players can move the cursor over the skill to see information on requirements and upgrading. 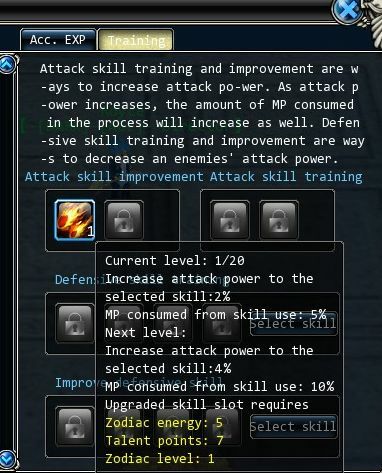 When a skill meets its upgrade requirements, players can left click the skill to level it up. Now go ahead and check it out for yourself!